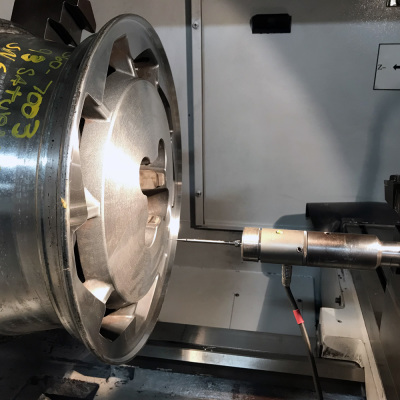 When Lehigh Alloy Wheel Repair CNC Lathe Machines are used to refinish alloy wheels, the procedure is quite straightforward with simply 3 steps: Digitizing, Trial-run, & Machining. 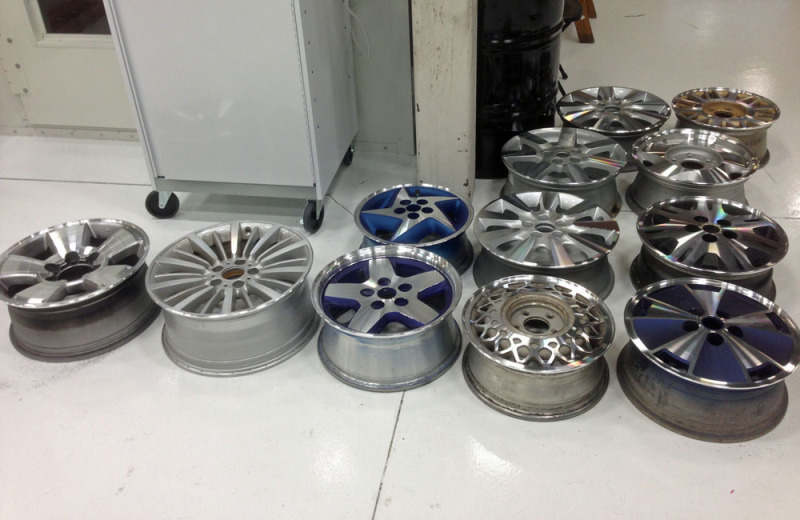 The first step is digitizing that alloy wheel thru a typical pass. 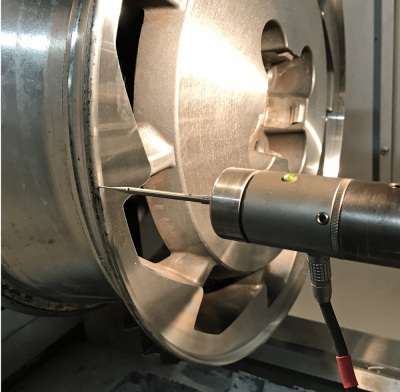 The digitizing probe is installed on the tool post of the Diamond Cut Alloy Wheel CNC lathe in order to record the rim profile before machining. Then, the operator will set up the starting position and the finsihing position for that alloy wheel. 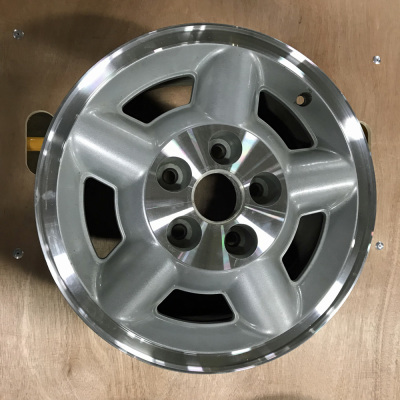 In most cases, the typical profile for alloy wheels should be continuous pass along the spoke from center of the hub all the way to the outside edge of the lip. Typical alloy wheel profile which is continuous from center of the hub to the lip. Alloy wheel with two machined surface sections , which are separated by its design. Choose the section near the wheel center hub as the first section for digitizing. 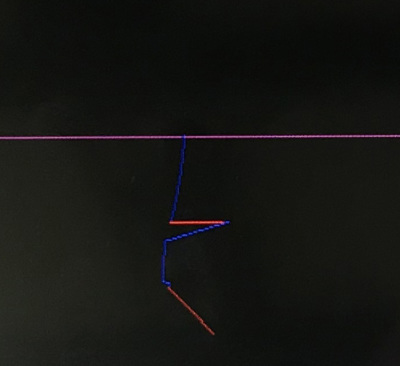 The operator should set up the End Position at the outside edge of the first section and the Starting Position at the edge of the center hub as shown in the following pictures. 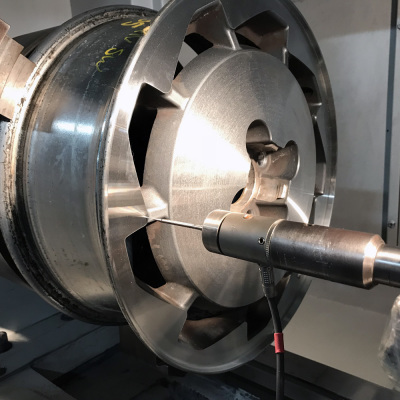 Set up the End Position for the probe with Lehigh Diamond Cut CNC Wheel Repair Machine. 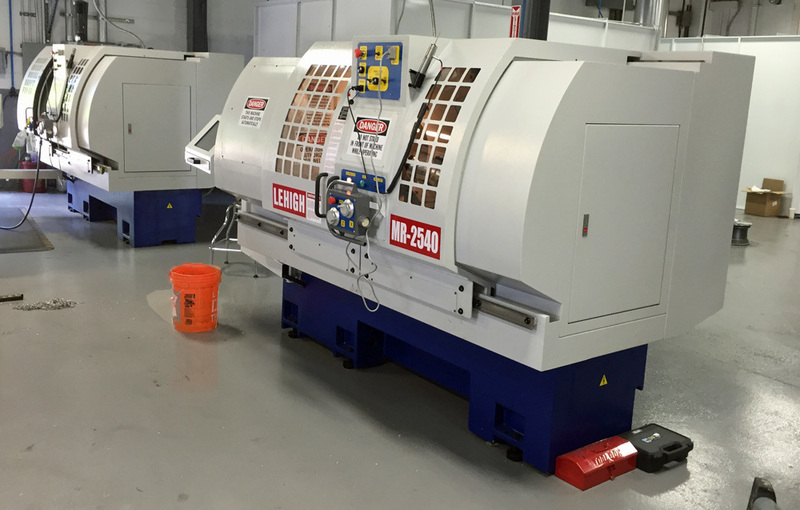 Set up the Starting Position for the probe with Lehigh Diamond Cut CNC Wheel Repair Machine. After completing the digitizing for the first section, the probe is moved away and its pass is recorded. The automatic digitzing starts after operator confirms his OK on the touch screen monitor on Lehigh's Alloy Wheel Repair CNC Lathe. When the digitizing probe travels to the end of the first section, it would stop at the end position preset by the operator. Then, there will be a prompt on the screen to ask operator to jog probe away from the rim and record this pass. 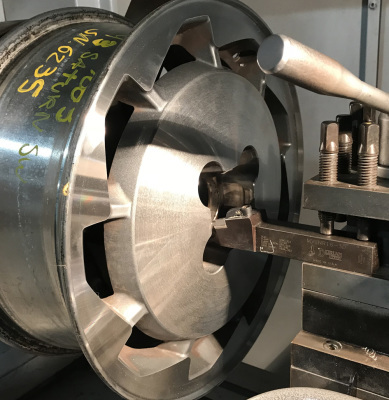 For the alloy wheels with machined surface in two sections, the clear pass for safety withdraw should be along Z-axis, moving it away from the alloy wheel surface for about 2 to 3 inches. Step 2 - Digitizing second section with Lehigh Alloy Wheel Repair Equipment. Now, it is very improtamt to touch-select "Digitize Another Section" at the bottom of the Touch-Screen Monitor on Lehigh Diamond Cut Alloy Wheel Repair CNC Lathe Machine. 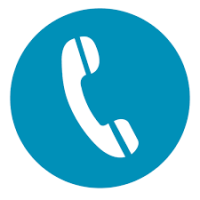 This authorizes the operator to start another digitizing for second section of the same alloy wheel. When this icon is touch-selected, it prompts the new digitizing section again just like that in the first section. Set up the End Position for the probe for the 2nd section with Lehigh Diamond Cut CNC Wheel Repair Machine. Set up the Start Position for the probe for the second section with Lehigh Diamond Cut Alloy wheel CNC Machine. The probe has been moved away after finishing the digitizing the second section. This final pass is also recorded. 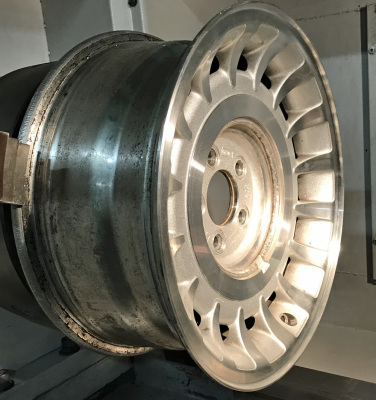 This time, you need to choose the section near the outside lip of the alloy wheel as the second section for another digitizing with your Lehigh Diamond Cut Alloy Wheel Repair CNC Lathe Machine. The cutting insert is point to the ZERO coordinates of the first digitized section. 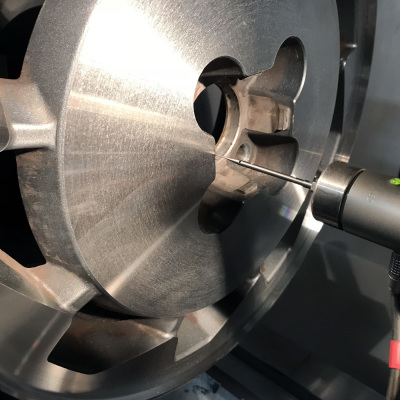 When the digitizing is completed for two sections in accordance with the steps described above, the operator is now ready for doing a Trial-Run in order to verify the complete pass of the cutting tool before actual machining process. 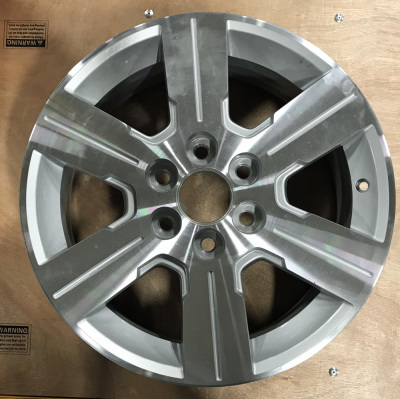 This Trial-Run process is specially designed on Lehigh Diamond cut Alloy Wheel CNC Machine, which verifies each profile with the actual wheel in order to prevent any potential accident from happening. 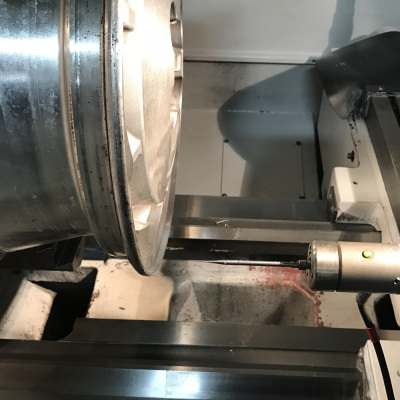 The Trial-Run process will take about one minute of time, very short, but very important process designed to verify the digitized profile as the genuine cutting pass before the machining performed by our Lehigh Diamond Cut Wheel Repair CNC Machine. The operator used the pendant control box with X-axis hand wheel and Z-axis hand wheel to move the cutting tool in manual mode to the starting position of the first digitizing section so that the tip of the insert of the tool holder matches the ZERO coordinates as shown in above pictures. After having touch-select X=0, Z=0 on the touch screen, the operator is able to use dial encoder to control the cutting tool to follow the digitized profile from origin (the starting position of the very first section near center hub) all the way to the End Position ( near outside lip of this wheel). 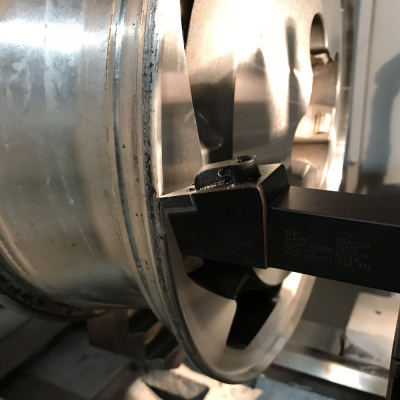 When the Trial-Run is completed with satisfaction, then, it is a simple matter to set up the cutting amount for both X-axis and Z-axis to diamond cut the alloy wheel surface from the starting position to the end position as recorded from this Lehigh Diamond Cut Alloy Wheel Repair CNC Machine.